Tested on a Shore A Durometer scale, the Competition Plates' average measurement was a 94, which delivers a consistent dead blow with minimal bounce found in high end Olympic weightlifting bumpers. Less bounce means less time chasing your bar around the gym. The plates have been given a gloss-matte-gloss textured matte finish and raised lettering for a bolder look. A raised rubber surface is now included to prevent direct metal-on-metal contact between the center discs. Whether stacked on the bar or on a rack, the bumpers only come into contact with each other on the inner and outer flanges—reducing scuffing and helping to preserve the plates’ finish and lettering. A convenient lip on the edge of the plate also makes it easier to pick up from the rack or off the ground. 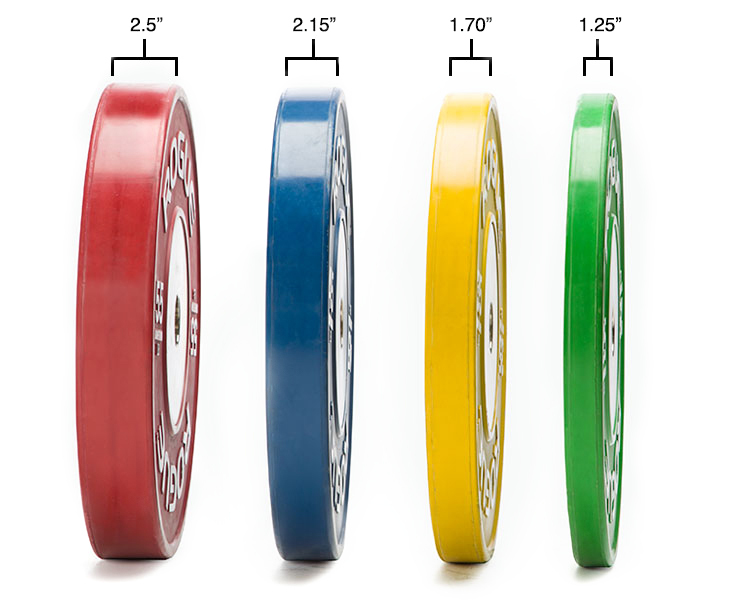 Rogue Competition Plates come in four vibrant colors (Red/55LB, Blue/45LB, Yellow/35LB, Green/25LB) and can be ordered in a wide variety of sets depending on your gym’s needs. See the order form on the right to choose the option best for you or contact us with a custom order request. Rogue LB Competition Plates is rated 5.0 out of 5 by 12. Rated 5 out of 5 by Skreener from Amazing plates I just got some 45s from the 2016 games and did my first workout with them. They are awesome. They aren't loud (working out in my garage at home) they don't have too much bounce, and I think they look amazing. I'll definitely be picking up some more plates to supplement my hi temps. Rated 5 out of 5 by kell from Love them! I just received my competition plates and they did not disappoint! They are even everything I expected, low bounce, durable, stylish. Great all around! Rated 5 out of 5 by regina from Simply D'Best Rogue! Do not doubt purchasing from Rogue only mistake was not buy it sooner. Rated 5 out of 5 by Rortega from Best Plates I’ve ever owned!!! I have them for about a month and they are so smooth when placing them on and off the bar. They are perfectly weighted. I love Rogue products! They can be expensive but they don’t cut corners and I literally use their products every day. The products last! I’ve had my Ohio bar (still in perfect condition) for years. Highly recommend! Rated 5 out of 5 by Ltam from Plates They look amazing. Well worth the price to have the best. Rated 5 out of 5 by LoganlovesRogue from I am addicted to competition plates I love Rogue quality. They are the best in the industry. Especially the competition plates. Rated 5 out of 5 by Shooter45 from Great quality, Like 99% of Rouge products the quality is very good. The first thing I noticed was the ballance of the plates. A very minor note: they are much wider than traditional steel plates but this is really a non issue for me. I bought my plates on Black Friday and saved $500 total between sale price, free shipping and no sales tax. I would purchase more to complete my outfit, but I will wait till next years Black Friday and buy again. Prices are high and not made in the US. Rated 5 out of 5 by R Mulligan from Excellent quality These plates are very durable and look awesome. I have a pair of 45's and a pair of 25's. They are much thinner than the black rubber bumpers. The color is bright and vibrant.